VATICAN CITY (CNS) — Saints aren’t superheroes, they are regular people who just never left God’s side after encountering him and his love, Pope Francis said on the feast of All Saints. “Being a saint is not a privilege of the few, like someone getting a large inheritance. All of us have inherited through baptism the ability to become saints,” he said Nov. 1. Before reciting the Angelus with people gathered in St. Peter’s Square, the pope talked about God’s call to holiness. What makes them stand out, he said, is once they encountered Jesus, they always followed him. 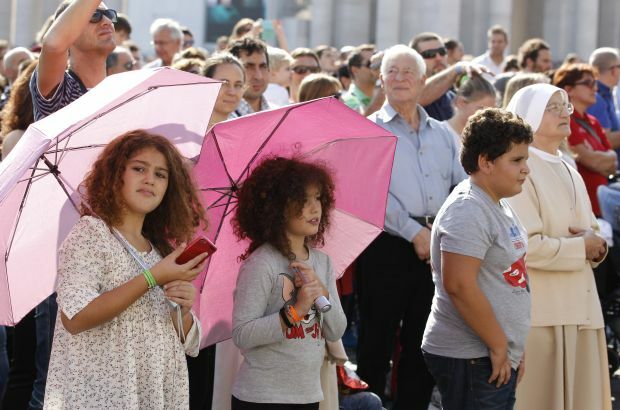 Jesus shows the way in the Gospels, especially with the beatitudes, Pope Francis said. Saints were people who followed God “with their whole heart — unconditionally and without hypocrisy; they spent their lives serving others; they put up with suffering and adversity without hatred; they responded to evil with goodness and spread joy and peace,” he said. The kingdom of heaven is for those who put their trust in and derive their sense of security from God’s love, not material things, he said. The kingdom is for those “who have a simple, humble heart; who don’t assume to be righteous and don’t judge others; who know how to suffer with those who suffer and rejoice with those who rejoice; they aren’t violent, but are merciful; and they seek to be builders of reconciliation and peace,” the pope said. Saints “suffered lots of adversity, but without hating,” he said. “He’s a good friend who is always at our side,” he said. After praying the Angelus, the pope asked for a moment of silence and prayer for the more than 90 people from Niger, most of them women and children, who died from hunger, thirst and fatigue while trying to cross the Sahara desert, heading to Algeria. The pope greeted the many men and women who ran in the annual 10-kilometer Race of the Saints. “St. Paul would say that a Christian’s whole life is a race for winning the prize of holiness; you are giving us a good example. Thank you for this race,” he said.